Prices start from £129/w all bills included! All our double penthouse en-suite rooms are fully furnished with a double bed, wardrobe, drawers, desk-chair, freeview TV and an en-suite bathroom. The rooms are arranged in cluster flats. The penthouse rooms are located on their own private floors. With spacious bay window kitchen/ living areas which each have their own fully fitted kitchen with modern appliances including a microwave, kettle and toaster. The kitchen also includes a dining table, dining chairs and leather sofas. 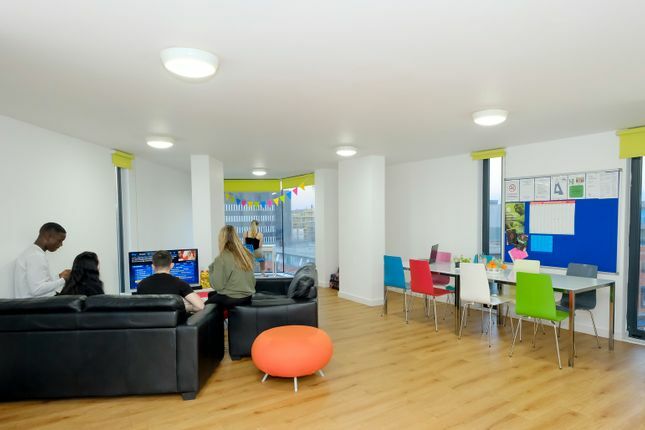 All the communal areas are complete with complimentary Netflix and free wifi throughout the building! As if this wasn't enough, we're finishing off with an on-site, fully equipped gym. The Edge comes complete with all facilities including; a laundry room, private residents courtyard and bike storage. Booking accommodation with X1 can assure that you have on-site security, a hands on maintenance team and your own friendly, supportive, Building Manager. We also regularly offer free social events, 'spot prize' Fridays and social media competitions, The Edge really is the best student destination for September 2018. To book a viewing or to ask us any questions give our office a call or click to enquire! We will be able to give you availability, answer any questions you may have and advise you on which property is right for your University experience! Property descriptions and related information displayed on this page, with the exclusion of Running Costs data, are marketing materials provided by X1 Lettings, and do not constitute property particulars. Please contact X1 Lettings for full details and further information. The Running Costs data displayed on this page are provided by PrimeLocation to give an indication of potential running costs based on various data sources. PrimeLocation does not warrant or accept any responsibility for the accuracy or completeness of the property descriptions, related information or Running Costs data provided here.